This past Sunday I made something that I haven’t made in a very long time and that is quick bread. I think it’s been months since I have made one. 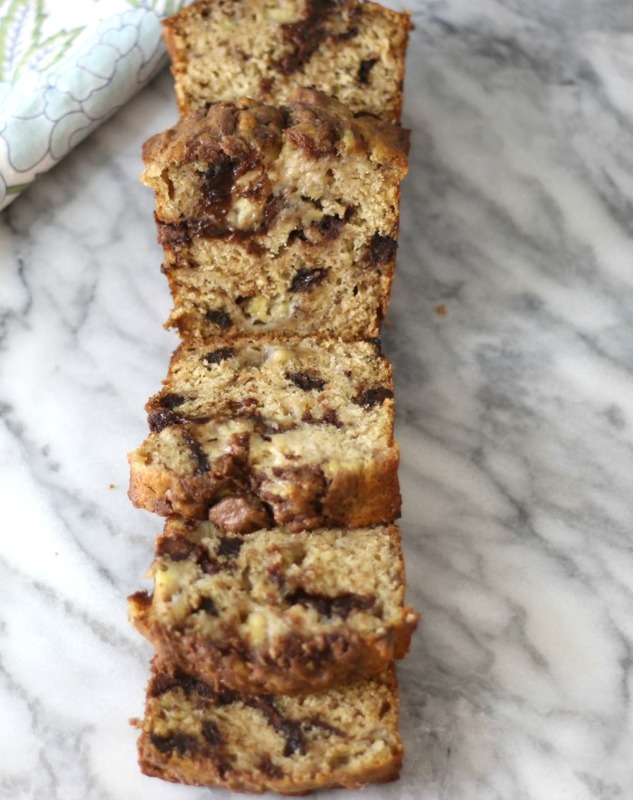 So I thought why not make some banana bread swirled with chocolate peanut butter and filled with chocolate chips? Sounds good doesn’t it? 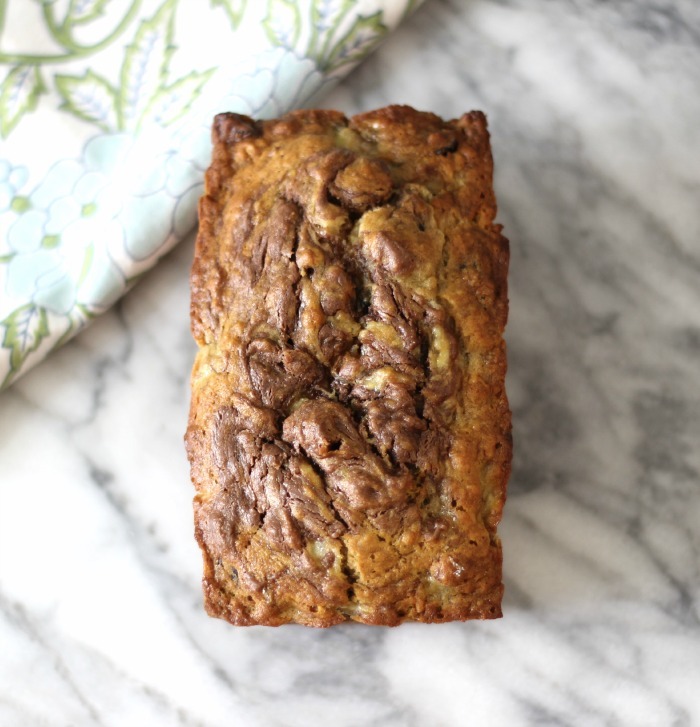 Well I must confess this is probably one of the best banana breads I have ever made. It is so moist, it’s crazy. I tried to make it as healthy as I could. I used whole wheat pastry flour, banana’s, applesauce and I cut back on the sugar, just because I was using chocolate chips in the recipe. I think if you make this bread you will be so pleased with it. For the peanut butter, I used Peanut Butter and Co. Dark Chocolate Dreams, but you could use Nutella or plain peanut butter. The calories will be pretty close to the same. If your peanut butter is to stiff, just microwave it for a few seconds to soften it up. The key to making this bread is not to over mix it. Doing that and you will end up with a dense bread. Plus using melted butter instead of soft butter. I like using butter in my baking rather than adding oil to my breads. I think you end up with a better tasting bread. Plus you get a nice buttery taste. 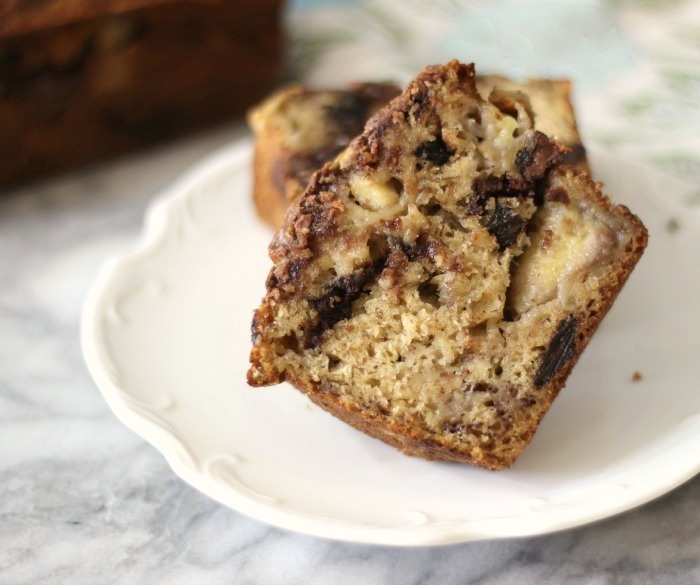 A simple, quick moist banana bread swirled with chocolate peanut butter. Grease a 9 x 5-inch loaf pan or 3 mini loaf pans with cooking spray or butter. In a medium bowl, whisk the all purpose flour, whole wheat pastry flour, baking soda, and salt until combined. In a large bowl, whisk the butter and sugar until combined. Add the eggs, one at a time. Beat in the vanilla, bananas, and applesauce. Add the flour mixture to the banana mixture; mix until just combined. 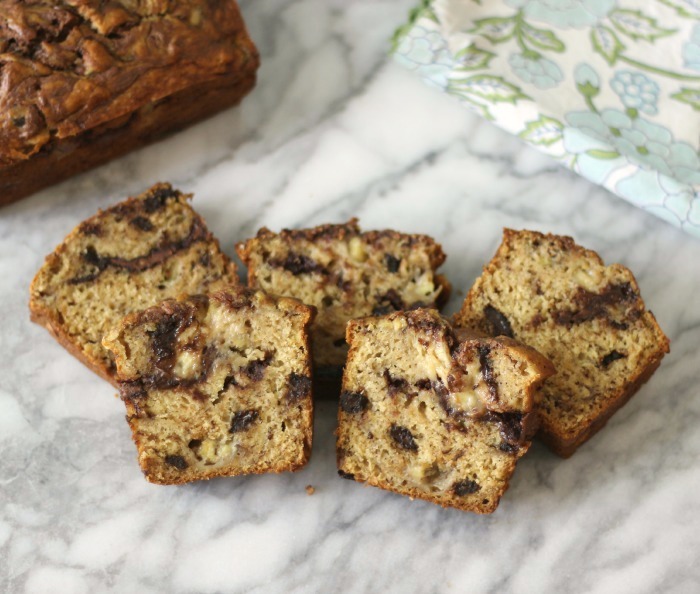 Pour ½ of the batter into the prepared pan, and top with ½ of the chocolate peanut butter. Pour the remaining ½ of the batter on top and finish with the last of the chocolate peanut butter. With a wooden skewer, or a knife to swirl the peanut butter into the batter. Bake in oven for 30 - 35 minutes for small loaves and 45 - 55 minutes for large loaf. Cook until the loaf is golden brown, pulls slightly away from the edges of the pan, and a toothpick inserted into the center comes out with just a few moist crumbs. Cool the loaf in the pan for 15 minutes, then invert onto a cooling rack and cool completely. If the bread starts to brown to much on the top, cover it with aluminum foil. 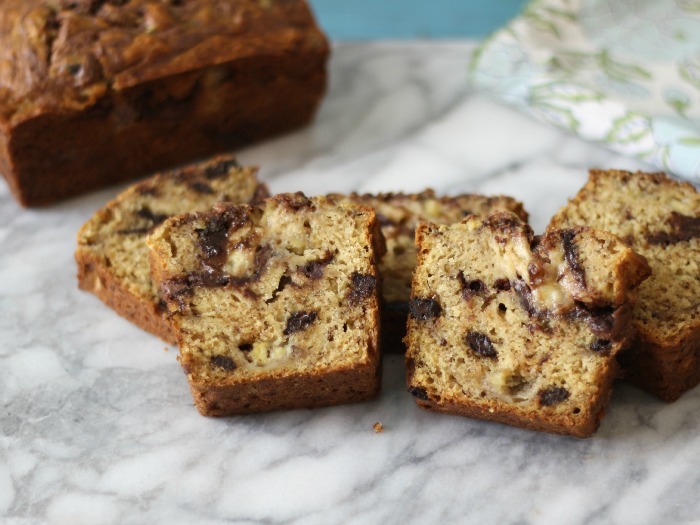 If you love banana bread and chocolate you will love this recipe, I promise. It is so amazing! Sorry to make it short today, time is just running so short. Oh man it really does look amazing! LOOOOVE it! I need to get some PB & Co’s peanut butter, sounds great!